Tidy your space, transform your life! Though her book The Life-Changing Magic of Tidying Up was published over four years ago, the recent launch of her Netflix TV series has catapulted her message of tidying to the forefront of our collective minds and conversations. If an item sparks joy, you keep it. If not, you get rid of it! That’s her method in a nutshell. It sounds simple in theory, right? I won’t belabor the details of how to deploy her system in your home, as there are many resources available for that already: her book, her TV show, and other blog posts and articles and interviews and such. What do you do with those things that don’t spark joy? That’s right… With it being a new year, many people are cleaning out their closets – particularly with this current Marie Kondo craze. 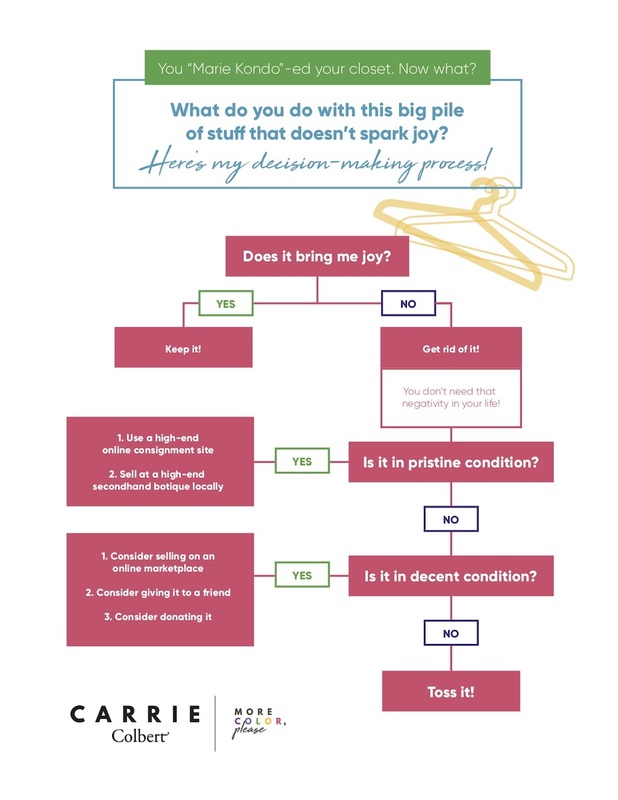 If you have gotten on the KonMari method bandwagon (like so many of us have! ), you are going to end up with a huge pile of stuff that does not spark joy. So, what do you do with that big pile of stuff that you no longer want or need? Well, I have to admit… That task used to stress me out as much as the process of cleaning out the closet! But at this point, I’ve done it so much that I’ve established a pretty clear process. I had never put it on paper until now, but I realized that I have a pretty set system.. When deciding what to do with the stuff I’m getting rid of, I basically walk through a flow chart in my head. Obviously, if something doesn’t bring you joy, get rid of it! Girl – you don’t need that sort of negativity in your life. Can I get an amen? Haha. What follows next is simply my personal process. Your process may look different. Or perhaps you don’t have a process. And if that’s the case, maybe this will give you some clarity. Is the item in pristine condition? First, I ask myself, “Is the item in pristine condition?” If so, there might be an opportunity to monetize your castoffs. Depending on your personal circumstances, collecting some extra cash might be appealing to you. If so, consider using a high-end online consignment site such as The RealReal. The RealReal is my personal favorite option, as they make the whole process so easy! From in-home pick-up to receiving your payments, the process is seamless and simple and hassle-free from start to finish. Conversely, of course, if you know of a reputable local high-end consignment shop, by all means, investigate that as an option. Is it in decent condition? First, consider an online marketplace such as Poshmark, eBay, or something of that sort. I myself have a Poshmark store. Incidentally, everything is currently on sale! (Browse it all here) Consider giving the item away to a friend for whom it does spark joy! Or, consider donating the item to those in need. The second consideration for items in decent condition is to give them away to friends! Now, let me be clear – don’t simply saddle your friends with your leftovers. Only give your items to friends for whom said items spark joy! That’s right – stay true to the spirit of Marie Kondo as you are passing along items to your friends. Thirdly, consider donating your items. There are so many people in need and so many wonderful organizations. Some of my favorites include Dress for Success, Goodwill, Salvation Army, and Star of Hope. But I beg of you – do not donate items that are torn and tattered beyond use. If something truly isn’t even in decent condition, toss it! 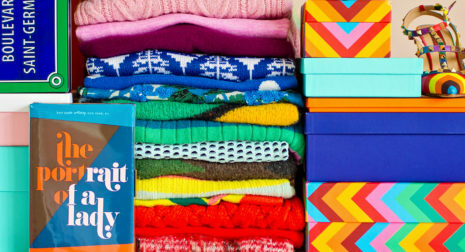 In the end, there are basically four options for addressing your closet castoffs: (1) sell them, (2) donate them, (3) give them away, or (4) toss them. What you do with your “non joy sparking” items will depend on the condition of the items, among a few other personal factors. In the end, we agree with Marie Kondo that gratitude is an essential part of this process. Indeed, gratitude turns what we have into enough. Finally, for a free printable of our flow chart, click here! I want to hug you for sharing TRUTH! When helping our kids clean out their rooms, they quickly say, “donate.” We’ve had very real conversations because if they wouldn’t want the item in the shape it’s in, why would someone else? Thank you, thank you, thank you! EXACTLY! I am all for donating! I do lots of that. But give things that will give that person joy. love the flow chart! its really easy for me to get rid of clothes because I just take them to my mom and she distributes to people of need in Mexico. now, purses and shoes are a little bit different. :). I absolutely agree with the “does it bring you joy” ! Karla – that’s so wonderful! Oh I didn’t know that, Sheri! Hmmm… wonder if we could figure out any work arounds? Let me know if there are any pieces you are ever eyeing! Did You Know There’s a New Easy Way to Shop for J.Crew? Do you love J.Crew as much as I do? Well, now there's a new super easy way to shop for J.Crew online! Learn more about the best leather personalized gifts from The Daily Edited.